This might lose me some friends, but I've been mustering up the courage to say this, and say it I shall: I'm kind of over brunch. Gasp! Sacrilege! I know! But what can I say, after my billionth overpriced omelette and weak bloody mary, after a few too many lackluster pancakes, after that biscuit that just isn't as life changing as it's billed to be, there it is. There's a lot to be said for languorous weekend meals with friends, and I'm all for mimosas, but I find myself missing weekend lunches - where did they disappear?! Then again, perhaps it all comes down to wondering why I need someone else to cook me some eggs when a perfectly good scrambled egg can happen so quickly and easily in my own kitchen. 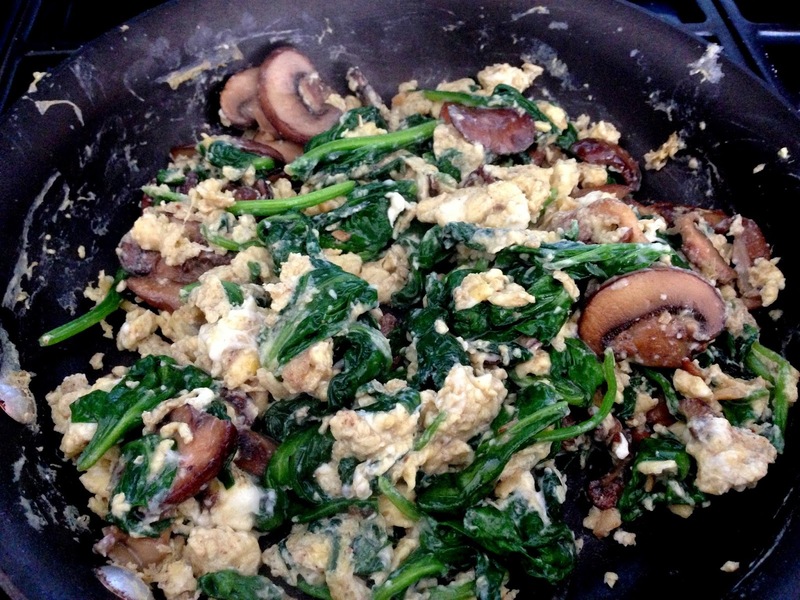 The key with scrambled eggs is personal taste, so really this recipe is more of a guideline than anything else. If you like your eggs a little overdone...be my guest, but I'm more of a barely cooked egg kinda gal. 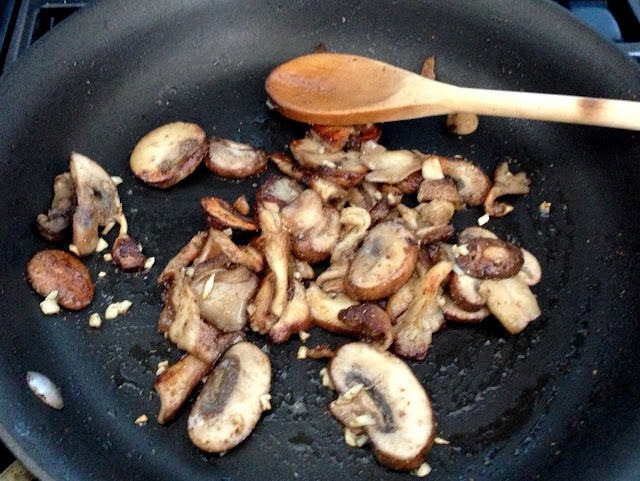 The eggs here look a little browned, but that's because of the little mushroomy bits scraped up from the bottom of the pan, and not because they cooked to that point - the eggs themselves should be even slightly runny when you turn off the heat, because they'll continue to cook in the hot pan. 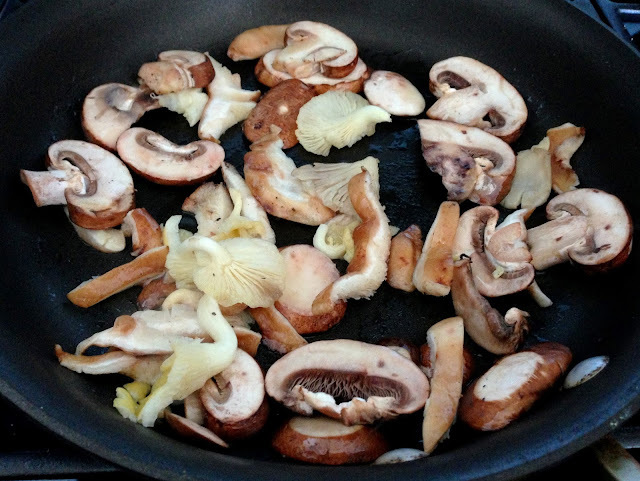 Heat a tsp of olive oil in a heavy bottomed pan. Add in the mushrooms, stir to coat, salt, and stir on medium heat until they start getting soft and brown. Add in the spinach and stir until just wilted. In a bowl, whisk together the eggs. Pour the eggs into the pan and let them sit for a minute. Stir them, making sure to incorporate the mushrooms and spinach. Sprinkle on the coriander powder, salt, and pepper, and stir to combine. 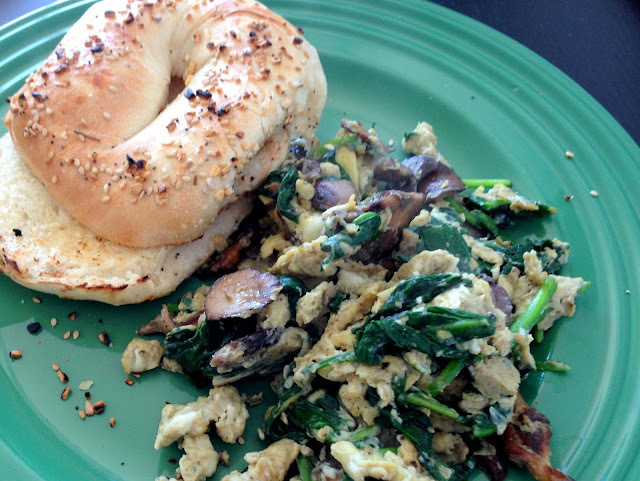 The coriander just adds a little something different to your run of the mill scrambled eggs. When the eggs are almost cooked (but still a little runny), turn off the heat and keep stirring for a couple of minutes. 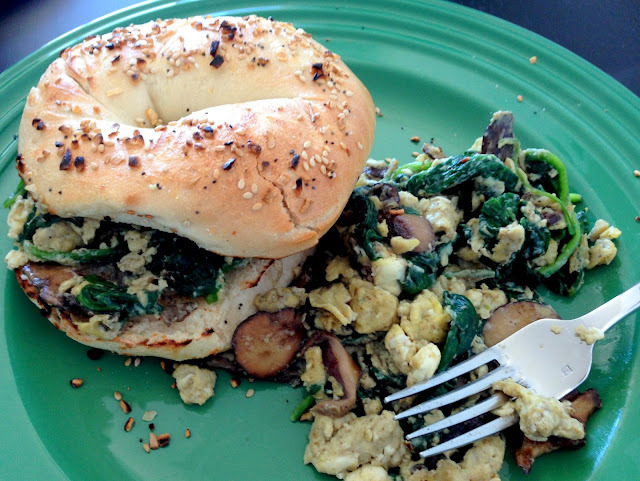 Serve with a delicious toasted everything bagel for a hearty tasty brunch!